Residential rents across Dubai registered no change during the first quarter of 2018, helping improve the annual rate of change to 3.1%, from 7.7% at the end of last year, according to leading international real estate consultancy, Cluttons. 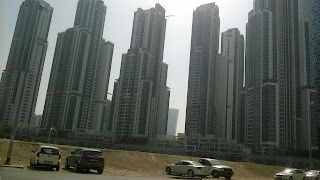 This marks the first stable quarter for rents in the emirate in over two years. 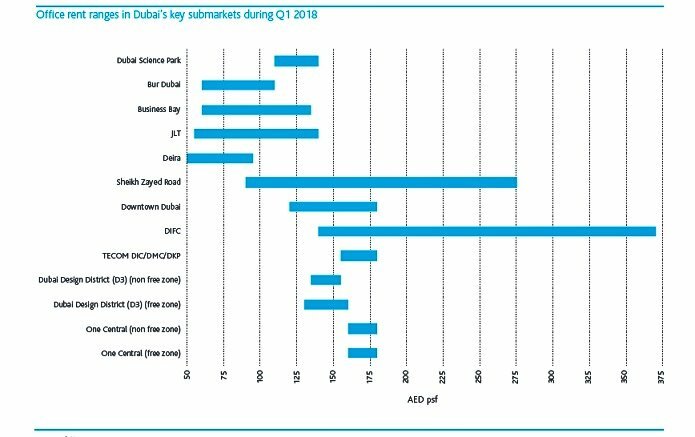 Cluttons’ Dubai Spring 2018 Property Market Outlook reports that while the rental market has shown signs of stabilising, the growing volume of off-plan investment stock, destined to be made available for rent after the handover, is likely to pose challenges in the future. The ability of the rental market to absorb a high volume of new stock will likely be tested over the next three years, it adds. In the sales market, the first three months of 2018 have shown a decline in average residential values across Dubai, falling by 2.5%. However, more affordable areas such as International City, and Discovery Gardens stood out as bastions of stability in the face of continuing headwinds for the market. Faisal Durrani, Head of Research at Cluttons, said, “Affordability aside, one of the key factors that have likely contributed to the stability in values in Dubai’s more affordable residential areas is the distinct lack of new supply in these markets. We expect demand to remain firmly centred on new homes priced under AED 800 sq ft as affordability takes centre stage in the market”. Cluttons expects the new proposed law to curtail off-plan sales activity, which has remained surprisingly resilient, despite a cooling in demand levels for secondary market property over the last three years. “At the end of the day, such rules are designed to protect buyers and preserve, and enhance the city’s reputation as an investment hub, especially as new international markets are increasingly being targeted by developers,” commented Strang. The report highlights the law may move developers to contain construction costs by cutting corners, which would ultimately impact investors’ confidence in off-plan developments. “While this may clearly be an issue, it does present the government with an opportunity to introduce more substantive building regulations around the quality of construction, with a view to raising the warranty offered on newly completed homes, which currently stands at just one year, compared to other international markets, where it is much higher,” added Strang. Overall, Cluttons expects values to slip by up to 5% or 7% this year and adds that it is quite likely this trend will persist well into 2019, catalysed by the buoyancy of the supply pipeline, before there is the potential for stability in 2020, once the supply pipeline starts to diminish. Like the residential rental market, office rents across the 24 submarkets tracked by Cluttons have remained largely unchanged during Q1, with just eight submarkets registering falls in upper limit rents of between AED 5 sq ft to AED 20 sq ft. On an annual basis, Bur Dubai (-21%) registered the steepest correction in upper limit rents, leaving them at AED 110 sq ft, or AED 30 sq ft lower than this time last year. “We continue to record a range of activity across the board, from companies expanding to some who are consolidating operations - while there is a wide range of new market entrants, some are attempting to regear existing leases. This depth of activity is characteristic of a normal market where rents are neither rising, nor falling rapidly and is indicative of a market that is healthy and mature,” commented Paula Walshe, head of International Corporate Services at Cluttons. “Despite this apparent stability, the city’s global nature means it is, more than ever before, influenced by geopolitical events and tensions. Although we are 4,000 miles away from the UK, Brexit is having quite a unique impact here, with some British occupiers looking to make cost savings at lease renewals. On the other hand, US firms, buoyed by positive economic news at ‘home’ are far more positive in their outlook, with a stream of new entrants from the States being complimented by expansionary activity among many US firms based in the city”, Durrani explained. According to Cluttons, the somewhat static conditions mean that landlords are keen to demonstrate flexibility for the right occupier, with contributions to fit-out costs. The report finds that an increasing number of occupiers are being motivated to relocate purely on the basis of cost, as well as the perception of getting better value for money. Business bay, for instance, has been the recipient of many occupiers departing from Deira and Bur Dubai over the last 18-24 months who have been drawn to this submarket by the attraction of letting relatively more modern and recently completed space. “However, in some parts of Business Bay, where transportation and pedestrian infrastructure is still playing catch up, the advantages of relocation may be negated by traffic issues as well as the lack of gravitas associated with a more established central business district. The latter of course comes with the added benefit of extensive street-level retail and food and beverage outlets, which give rise to a vibrant and desirable place to work. This may well change with the opening of Marassi Business Bay and once the area reaches a certain level of office occupancy. “The decision to relocate for cost savings is both complex and challenging. Often, regearing existing leases, making more efficient use of existing office space, with flexible break options, may be more beneficial in the long run,” commented Walshe. “Overall, flat conditions will likely linger through 2018, with any rent falls likely to be contained between AED 5 sq ft to AED 20 sq ft. Free zone areas will continue to buck the trend as their position as the most desirable submarkets for most new occupiers remains unchanged and unchallenged. 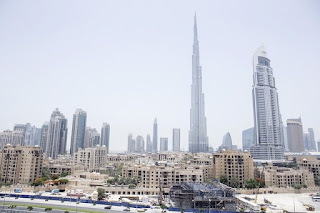 That said, new supply in locations such as the Innovation Hub in Dubai Internet City, Silicon Park in Dubai Silicon Oasis and Brookfield Place in the DIFC will undoubtedly test rental stability in these locations.” Durrani added. The report shows Dubai industrial rents have continued to drift, following on from a challenging 2017, which saw the market being hampered by an excess amount of speculatively developed supply. 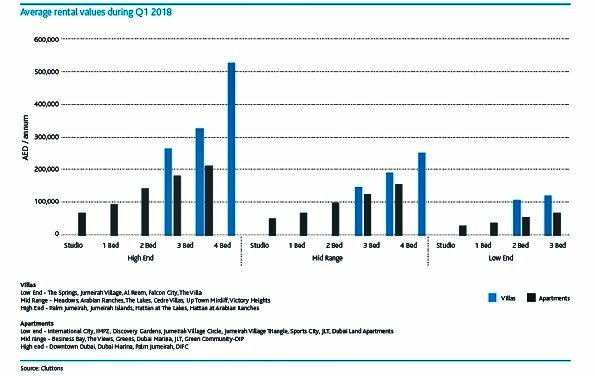 This overhang of warehouse stock still remains across all submarkets monitored by Cluttons and is likely to put rents under more pressure as the year progresses. As highlighted in the report, the market is currently going through a period of normalisation, with occupiers being drawn to more modern, newly completed stock. “Once we work our way through to the end of this upgrade cycle, rents for the older stock are likely to continue slipping, which will probably catalyse redevelopment of historic warehousing. Until we get to that stage, rents are likely to slip by up to 5% this year, with any declines contained between AED 3 sq ft and AED 5 sq ft,” commented James Lynch, Industrial Agency. As part of its expanded hospitality sector services, Cluttons has, for the first time, including an outlook on the emirate’s hospitality sector. The report cites data from Dubai Statistics Centre, highlighting that 10 new hotel properties were added to Dubai’s in 2017, taking the total number of rooms up by 4,854 to a total of 82,733 keys. Overall occupancy levels have also improved, reaching an average of 78% last year; up from 76% in 2016. 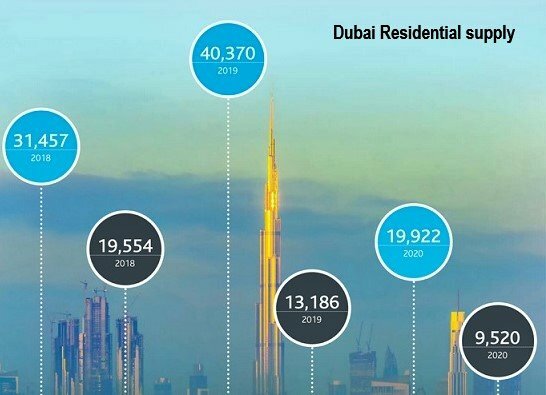 Cluttons points out that although the hospitality sector remains a bright spot in the emirate’s property landscape, the rising number of hotel and hotel apartment properties, combined with the rise of Air BnB, is likely to sustain downward pressure on revenue per available room (RevPAR), which has continued to decline in recent months. Dubai’s real estate authorities have decided to retain the status quo on the percentage developers should put up in escrow before launching off-plan sales. But there could still be significant differences between what developers used to put up earlier and what they have to do now. In a statement issued Thursday, the Dubai Land Department said developers need to place in escrow 20 percent of the “total project value”. Developers until now had been used to putting up a bank guarantee of the “value of the construction”. Clearly, there will be a marked increase in developer guarantees if the “project value” is enforced. Project value is much more than the sum of the costs related to construction. Developers will be awaiting further clarification from the real estate authorities on what this might mean. There is a strong demand from developers to “deposit the 20 percent escrow of the total value of the future projects they intend to launch”, the Land Department statement had added. Dubai’s developers may no longer be able to rush out with their off-plan sales — they will need their projects to reach the 50 percent mark before they do so. The earlier requirement was for a project to be 20 percent ready before sales could be launched. Such a move could have far-reaching consequences for developers — especially the smaller ones — as they would have to wait longer to get funds flowing back into their operations. But the latest changes would be for the greater longer-term benefit of the market, sources add. This would prevent those developers trying to get sales pushing projects with bare minimum down payments and extended post-handover instalment periods for buyers. Last year had seen a flood of off-plan launches and sales and with the majority of these projects expected to take three to five years to complete. Many had been expecting the pace to be maintained this year as well. 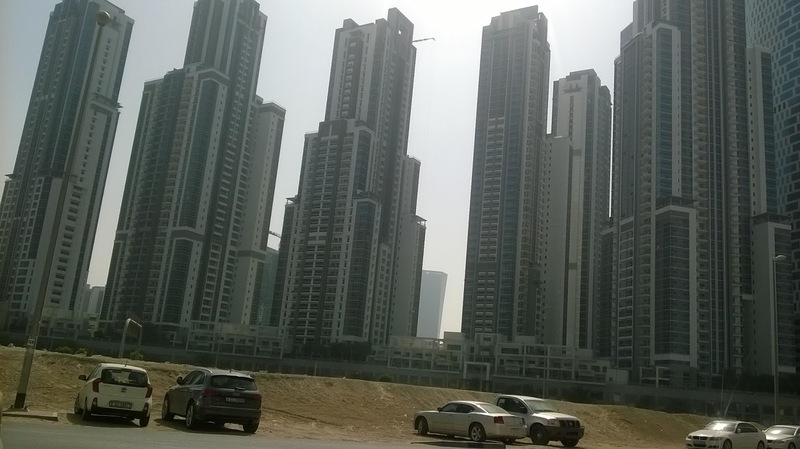 Leading developers such as Damac had been warning the market that these handover terms could have serious consequences if, in a future downturn, buyers stopped payments and developers were left with “dead” stock. According to estimates by JLL, the consultancy, more than 95,000 residential units were launched in Dubai and with likely completion dates before end-2020. “This is approximate twice the average demand over the past five years,” said Craig Plumb, Head of Research — Mena at JLL. “If all these units were to be delivered, there would be a likely oversupply and which would have a negative impact on sale prices and rentals. Developers will also need to have a serious think about when they complete a project and how the sales are faring on it. Because any unit left unsold three years after construction will be subject to VAT. Apart from oversupply, market watchers were also getting anxious about the quality of build of some of the new projects. They warned that cash-strapped developers could start cutting corners just to get the project off their hands. “The new policy, if it comes into full effect, will reduce the systemic risk that is currently building up on the back of a few developers flooding the market with sometimes poor quality products at heavily discounted prices,” said David Godchaux, CEO at Core Savills. “The (50 percent requirement) will act as a screening mechanism for developers. They will now have to ensure they are in a stronger cash flow position to sustain the development risk without the help of capital guaranteed from off-plan sales. Developers sources were unavailable for comment. But the fact that the leading master-developers will not be impacted will ensure that a steady flow of off-plan launches will continue. As for private developers, they will now have to show more “skin in the game” in terms of putting in their own funds and on the project site. 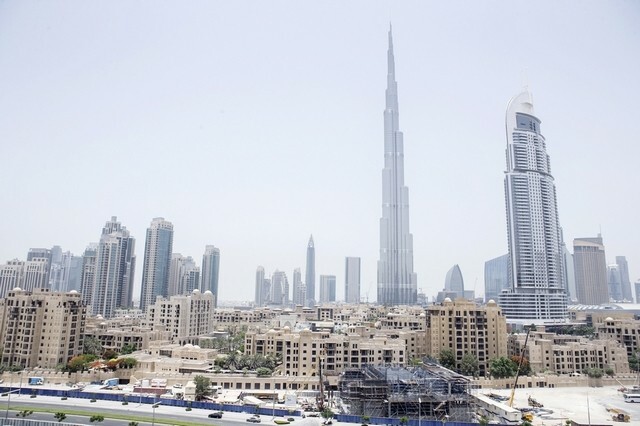 Some developers had privately been voicing concerns that the pace of off-plan launches last year meant a return of speculative buying in Dubai’s property market. For the greater and longer-term good of the marketplace, this had to be nipped.